It’s going to be a very different Christmas in our home this year. First Born and The Groom will be spending their first Christmas as a married couple in their Philadelphia apartment. Second Born will be celebrating her Christmas and the end of her semester abroad in Rome with her best friend. Because Spouse is on call for his job we’re not able to make much in the way of plans. I was just thinking that maybe it’s time for a change in seasonal decorating, when a unique motif presented itself quite by accident. A few days before we were leaving for our Excellent Adventure I somehow veered off on a cleaning spree. It wasn't on purpose - cleaning never happens on purpose in my house. I headed toward the bathroom planning to grab a few washcloths for our impending trip abroad. Don't ask me why - someone suggested bringing washcloths. Upon opening the drawer that I’ve been stuffing washcloths into for several months (years maybe), several of them threatened to jump out at me. I dug a little deeper to find out what was causing the overflow that I had been ignoring. Toothbrushes, that's what. Old toothbrushes had been stuffed into the bottom of the drawer under the washcloths. I do believe there was a couple in there from when First Born was in middle school (she’s 27). These were old toothbrushes that would most likely never be used for anything but had been saved "just in case" we needed to scrub every wall in the house with them. Let me just point out that the idea of saving these toothbrushes for future use is not based on factual studies or previous experience. At no time did Spouse ever wipe out a dozen or more brushes while cleaning grout. 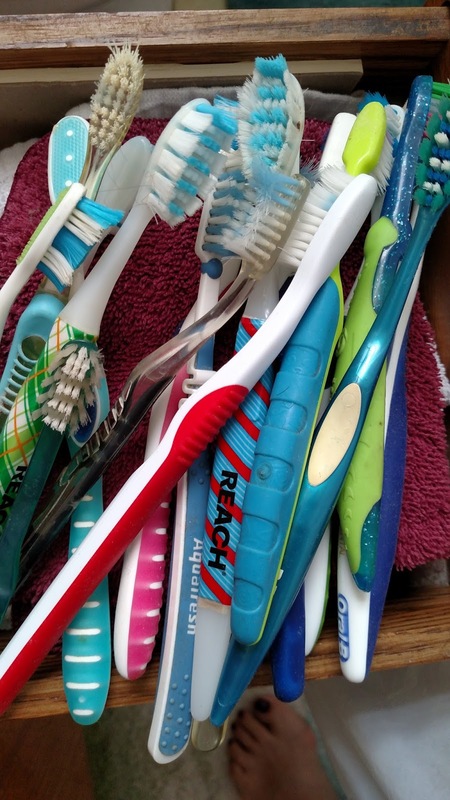 We have become toothbrush hoarders because nobody said to stop saving them. I have to admit it made for a colorful array of handles against washcloths. Naturally, I took a picture. Rather than be disgusted by this find, I considered it a sign. Here was my new Christmas motif. Imagine if we took only what we could find around the house and decided that would be what our new holiday decorations were based on. I’m thinking a colorful variety of toothbrushes strung side-by-side on the mantle (I mean, if we had a mantle). That would surely lift our holiday spirits. Besides this not-so-interesting discovery in the bottom of the washcloth drawer I also unearthed 12 plastic clothespins. On occasion I will put something on a hanger and need a couple of extra clips to keep it on there while it dries hanging in the bathroom. Apparently this collection of a few clips morphed into half the bag of clothespins, which explains why I always run out during the summer when I’m hanging clothes outside. It’s a mystery to me how the smallest room in the house with the least amount of drawers has become the collection room. We won’t even discuss the bathroom cabinets. Even though they go through a period cleaning (is every three years considered periodic?) I strongly believe someone sneaks in when we are at work and jams another box of bandaids or an extra tube of sunblock in there just to mess with me. At this point the last thing I should be concerned about is what’s in the bathroom drawers. I’m leaving within hours for vacation and there is still plenty to get done. In fact, I just thought of one more thing I can’t quite scratch off my to-do list yet. I still haven't packed washcloths.